Fisher Engineering added three models to its tailgate spreader line—the SPEED-CASTER 900, SPEED-CASTER 525 and QUICK-CASTER 300W wireless electric tailgate spreader. The SPEED-CASTER 900, at 9 cubic feet, and the SPEED-CASTER 525, at 5.25 cubic feet, are powered by two instant-start, 12-volt electric motors. The SPEED-CASTER 900 model holds up to 720 pounds of bagged or bulk deicing material and is available with optional 2-inch receiver hitch, three-point hitch and pivot/GM pivot mounts. The SPEED-CASTER 525 model holds up to 420 pounds of deicing material and comes standard with combination 2-inch and 3-point hitch mounts. Both the SPEED-CASTER models feature a dual variable-speed control that allows operators to match material delivery and spread patterns to conditions. The LED control features three standard accessory buttons, a dedicated blast button and digital self-diagnostics that alert the operator when the spreader is empty or adjustments are needed. 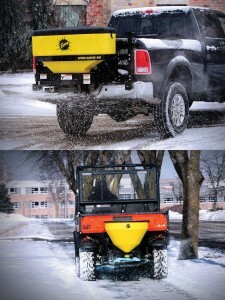 The QUICK-CASTER 300W wireless electric tailgate spreader comes standard with a 2-inch receiver hitch and seven-pin plug. The wireless one-touch, on/off key fob control provides convenience and offers two spinner speeds to match spread patterns to the application. A fully enclosed 12-volt motor and maximum torque transmission power the QUICK-CASTER spreader’s 10-inch corrosion-free spinner. The hopper holds up to 3 cubic feet of rock salt. A clear weather cover is available as an accessory.